"Going Home Bridge Floral Jacquard Throw" James Lee uses soft lines and colors to create images that envoke peaceful and tranquil thoughts. 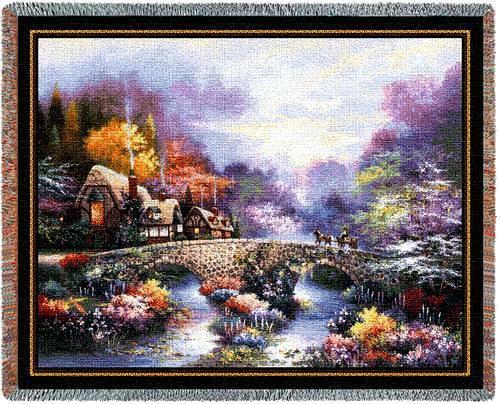 A carriage travels over a cobblestone bridge going home to a cozy cottage with a roaring fire in the fireplace. This makes a beautiful addition to any home decor! Cotton blend. Woven on Jacquard looms. Measures 53" Wide x 70" Long. PLEASE NOTE: Shipping ONLY within the continental U.S. Hawaii, Alaska, and Puerto Rico residents must contact seller for shipping quote before ordering.